I overslept. The dog ate my homework. I couldn’t call because someone shot my phone. And then dropped it in a puddle. Before you get nervous about that last one, take a look at Taktik, a gorgeous new iPhone case that just happens to protect your phone from anything short of molten lava, accepting orders now for delivery in August. This is the kind of indestructible, no-excuses case that Eastwood would... actually, Eastwood wouldn’t even have a cell phone. Jason Statham in The Transporter—now he’d have something like this. 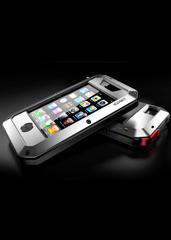 Of course, should your phone go up against a bulldozer and survive, you’ll want to tell someone about it. So you’ll pop open the aircraft-grade aluminum seal over the headphone port and get to talking. Note: you may want to register your phone as a weapon in some states.